Did you know that catering colleges run training restaurants where meals can be had for close to cost price? I didn't. The word 'Tiros' means people who are learning, and while the staff at Tiros @ 120 are learning (Tafe SA's catering school is back of house, hospitality school out the front) it is far from amateur. The students are supervised by experienced instructors, and many of them have worked in restaurants before. The menu is designed by the students and features bistro-style dishes that change with every season that the restaurant is open. I ordered the lamb shoulder with cannellini beans and a crumb crust. I was expecting a cut of slow-roasted lamb shoulder alongside the beans, and was let down to be served a tomatoey lamb and bean casserole with a panko and parsley crust. The meat was tender and the beans were firm enough to stay together in the casserole, but it didn't knock my socks off. 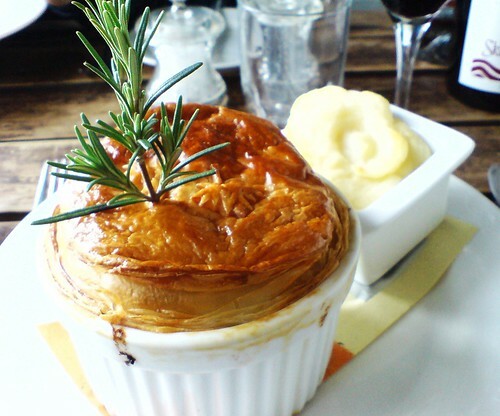 Others ordered a steak and kidney pie with sweet potato mash that they loved, and paprika chicken with herb spatzle. The staff at Tiros were cheerful and attentive without being annoying. It was obviously a busy service, but the staff didn't miss a beat — our food came out lightning fast. Too fast, actually. I can understand the need to create a fool-proof menu that can be prepared ahead, but the kitchen were so well prepared it felt to me like cafeteria food with fancier plating. No restaurant starts a service without pre-making some of its food, but at the best you wouldn't know it. A grilled chicken breast instead of chicken simmered ahead in sauce, or pan-friend (but pre-boiled) potatoes replacing a warmed mash are simple changes that can make a tangible difference. With twice the number of chefs of a comparable café, it's disappointing that Tiros relies so heavily on pre-making entire dishes. Maybe I'm judging Tiros by the wrong standard — including drinks my lunch came to only $15 and it was much better than many other $15 lunches I've had. And it's not Martinhas either, which is Tafe's student-run a la carte evening restaurant (opening again July 23). 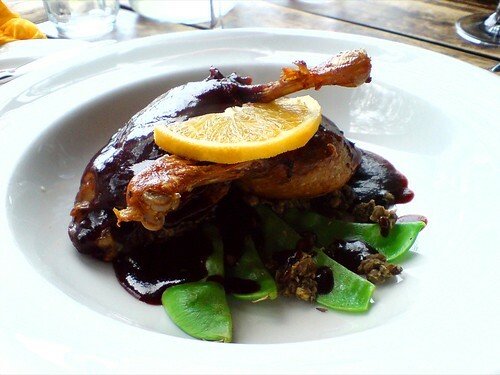 Although I felt that its 'bistro-style' food wavered into cafeteria territory, the chefs executed their menu solidly and the friendly service made for an enjoyable afternoon. Tiros @ 120 will be open this season until July 11. 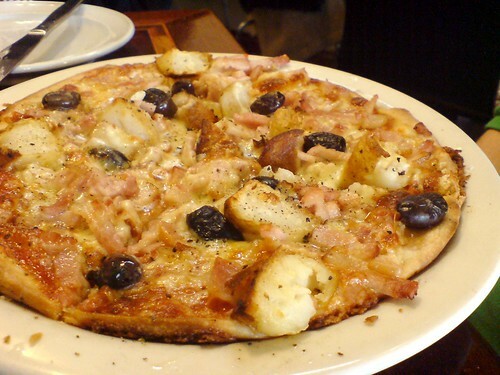 2008 opening dates for Tiros @ 120 and Martinhas can be found on Tafe SA's website. This morning started out badly. I woke up hungover (who knew that darts was such a rowdy game? ), and the cold that had been simmering for the last week finally hit. I walked downstairs for my ritual two pieces of peanut butter toast and remembered that my original Friday night plan was doing the dishes that had accumulated over the last week. Once I'd eaten my toast over the sink I sat back on the couch feeling sorry for myself. Before long my pity party was interrupted by Mum inviting Lucy and I out to lunch. I was feeling quite undignified, but faced with the alternative of a bacon sandwich eaten off the lid of a lunchbox, I obliged. Cafe Bravo sits on the corner of the Parade and Edward St in Norwood. In primary school I had a friend Edward who lived on Edward St, next door to a transitional home for people with mental illness. Edward had a tennis court and at night the people from next door would often jump the fence and hang out on his tennis court. They told me if you say "Candyman" in front of the mirror 3 times that Candyman will kill you. I never slept well at Edward's house. But that's really neither here nor there. While we waited for Mum to arrive we ordered some garlic bread. It was your typical café garlic bread, quite nice. We did have a problem with the waitress who had to be convinced to give us side plates for our garlic bread ("We only give you side plates once you order a main meal"), but otherwise the service was fine. The food at Cafe Bravo is terrific. The menu is the same as just about every other restaurant of its type, but the difference is the way they make it. You can get spaghetti bolognese in any café in Adelaide, but at Cafe Bravo the bolognese is a rich ragu with chunks of slow-cooked beef that melt between your teeth. 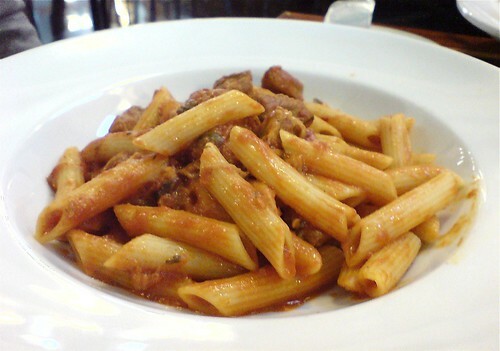 Mum and Dad both had the special — penne with pork ragu. I was surprised by how clear the flavour of the pork was, they'd clearly used good quality meat. Lucy enjoyed her pizza la campagna (potato, bacon, and olives), and I had the lasagna. Oh my god. This lasagna was amazing. Alternating layers of tomato sauce, ham, and mozzarella finished with Bravo's beef ragu. 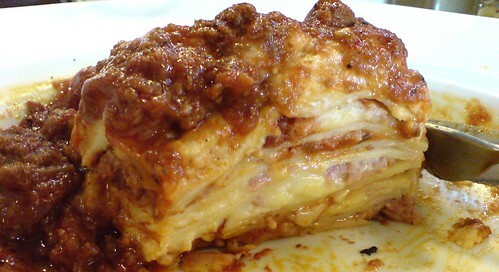 The serving was perhaps a little large for such a rich lasagna, but this time I wasn't complaining. 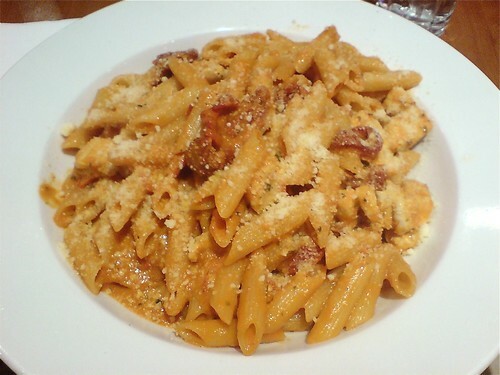 In a city with a large Italian population, bistro cooking means Italian cafés. People generally don't give these sorts of restaurants much thought — they're everywhere, they're not fine dining (nor do they want to be), the menus are frequently interchangeable from one place to the next, and their success depends more on location than the quality of their food (what's that about Bocelli?). Still, that doesn't mean they can't be done well. Eat at Cafe Bravo for an example. I don't understand how this place is always packed. 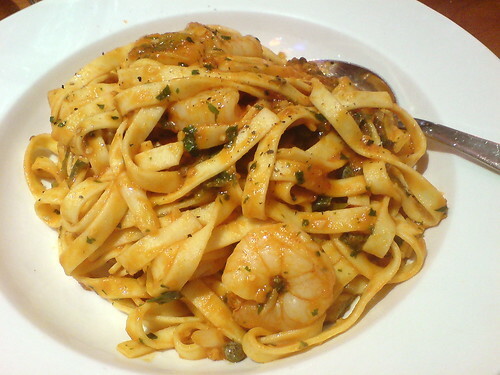 The prawns in my fettucini gambieri were rock hard, and my sister's penne con pollo was too salty. To make matters worse the servings were enormous. Even the best food can get overwhelming if there's too much of, and this is not the best food. It's not the worst food either, it's just very mediocre and not worth the inflated prices. Italian food is about not being afraid to showcase your ingredients. Buying the best and treating it simply. Eating at Bocelli, you get the impression they don't really care about their ingredients. Tasteless, dry chicken. Stodgy, gummy gnocchi that's obviously bought in. The specials board was advertising 'Beef fillet on the bone' (what bone? ), and when I asked whether the crab linguine special was made with fresh crab the guy taking our orders (the owner, no less), rolled his eyes and replied, "I don't know, probably frozen". In Adelaide there are a handful of terrific Italian restaurants (Chianti Classico I can vouch for, and I've heard great things about Enoteca and Àuge), several good ones, and a long tail of mediocre ones. Bocelli fits into column three.